through an I2C bidirectional bus. A precision temperature-compensated voltage reference and comparator circuit monitors the status of VCC to detect power failures, to provide a reset output, and to automatically switch to the backup supply when necessary. Included on this module is an Atmel 24C32 32K (4096 x 8) serial I2C EEPROM which allows the module to be used as a simple data logger storing up to 4K of 8 bit data. If you plan to use this module with a standard Arduino then you can take advantage of our exclusive library (HCRTC) to quickly integrate this module into your own Arduino project. The library also provides the ability to read and write to the included EEPROM. 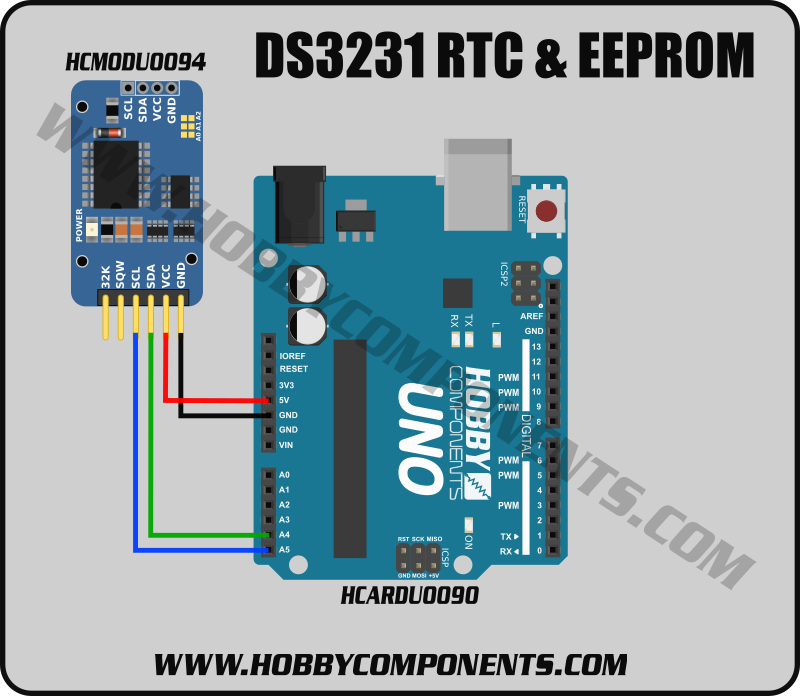 write to and from the DS3231 real time clock & 24C32 EEPROM (HCMODU0094). /* Initiate a write sequence. I'm having trouble with the HCRTC sketch. I'm getting an error saying that HCRTC.h doesn't exist. Please see screenshot.jpg attached. If any of these folders don't exist just create them. After you have moved them there you will also need to restart your Arduino IDE. Alternatively you should be able to install the library by selecting Sketch->Include Library->Add .Zip library in your Arduino IDE. Then just point it to the HCRTC.zip (must be in its zipped form) file. It should then automatically unzip the files and put them in your Library folder. Thanks for that it solved my problem! I'm very new at this and learning fast with help from people like yourself! Hi, the red led is very bright for my project, . Is there a way to switch it off? If not, will removing it effect the operation of the RTC?? The power LED is connected across the 5V supply so I'm afraid there is no way to turn it off. The only other thing I can suggest to avoid having to desolder it is to use a permanent marker pen or tape to cover it. If you do want to permanently disable it then you may want to consider removing the black surface mount resistor (marked 102) next to it instead as it is less delicate. I was looking on Amazon for an RTC for an Arduino project, I noticed that there were a few reviews of this model with warnings about battery charging see below, is this a genuine issue? Does this come with a CR2032(non-rechargeable battery) or LIR2032(rechargeable battery)? Is there a charging circuit built in? Should the charging circuit be disabled as described below? 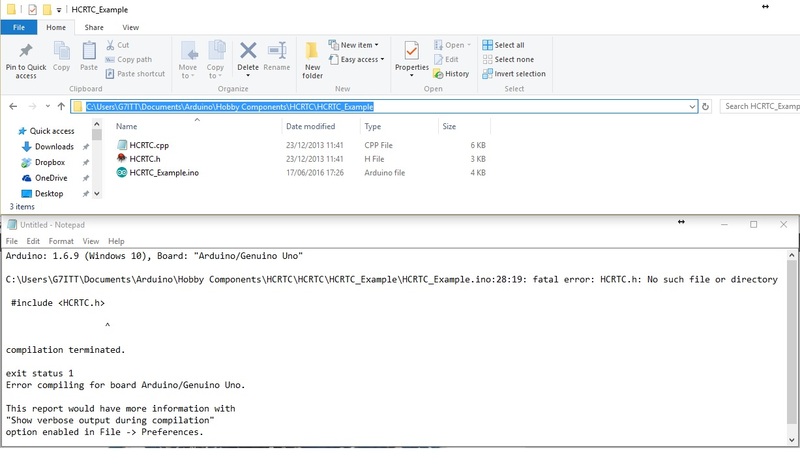 Fine RTC for Arduino but also a ***WARNING***: The device is specified to operate in range 2.3V to 5.5V but has the design flaw that it FORCE CHARGE the CR2032 battery when in operation! Operation the device at 5v the 3v battery swollen up after a while and there is a high risk for explosion! But no matter what operation voltage a CR2032 battery shall NEVER be attempted charged! A solution is to remove the diode from the circuit or to cut the PCB trace between the diode and resistor 201 on the board. In this circuit a CR2032 battery will last forever anyway, so there is absolute no reason to try to recharge it! The module should be shipped with a rechargeable LIR2032. Yes it has a basic charging circuit consisting of a 200R resistor and diode that will charge the battery at about 22mA (~0.5C) when powered via a 5V supply dropping to about 1mA (~0.2C) when fully charged . If you are using it with a CR2032 then charging circuit should be disabled. This can be done by removing the diode or the 200 Ohm resistor. Both are located near the SCL pin.